I read this first thing this morning and afterward, felt like I didn’t need to go to church as I had already experienced the best sermon I’m going to hear in a while. Thank you. In the church calendar, today is Pentecost, often represented by fire — which was certainly burning inside you when you wrote this and then included the image of the dragonfly you and Liz lovingly captured. I’m taken by the juxtaposition of a hunter out for the kill and then the delicate dragonfly. I imagined a hunter aiming for a dragonfly and missing every time. I loved that. 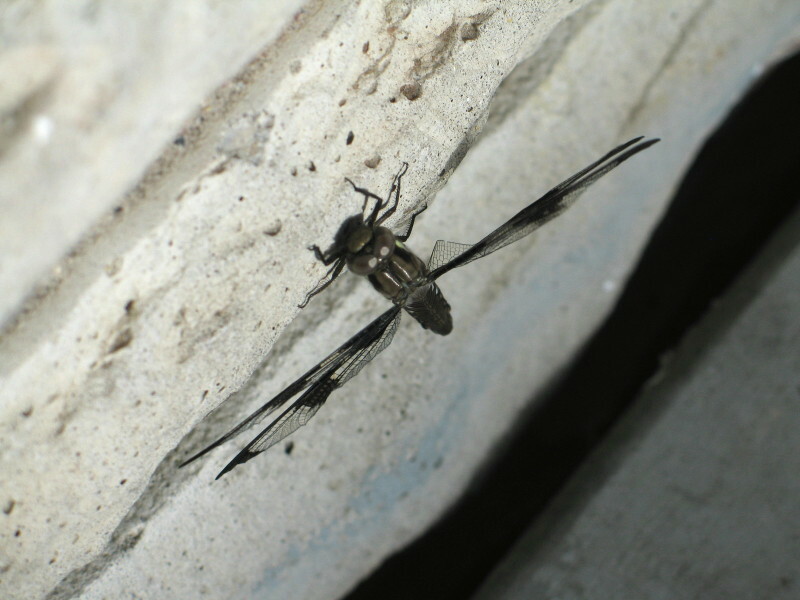 Hopkins wrote, “as kingfishers catch fire, dragonflies draw flame.” The peaceful flame of the dragonfly eludes the hot trigger every time: both a pentecostal thought and a Memorial Day tribute. Thank you. Thanks for your kind comments on this late night write. Beautiful quote by Hopkins. I assume you mean Gerard Manley Hopkins, poet and Jesuit priest (link)? The piece on NPR about Cody was by a man who loved the outdoors ritual of hunting and the connection it gave him to the Wyoming land. It reminded me of the bonding ritual of hunting that my brothers and father used to do each winter. It was a ritual for them and we would end up eating the meat all year long to supplement lean times. The intention of that is so different than killing for the sake of the kill. And then somehow the connections to Memorial Day and war arose in me. I am always struck by how everything is so connected. The smallest actions have huge consequences – from elk to dragonfly. I feel a peace inside this Memorial Day. Though war seems to be raging all around – dragonflies draw flame. BTW, there’s an update on the garden this morning. As Liz and I were having coffee on the deck, she spotted the tiny Gibraltar slender bush clover she planted in the front yard had been beheaded! So Liz dug it up from the yard and now we’re trying to revive it on the deck. We’ve got herds of deer that wander around our neighborhood. A beauty – but, well, they eat a lot! That’s my garden update from the Heartland. We have what must be a relative of that clover bush growing under one of our cottonwoods. My sister asked if it was a fern but I said I thought it was a clover. And now there are pink flowers that look very similar to the ones in the link. 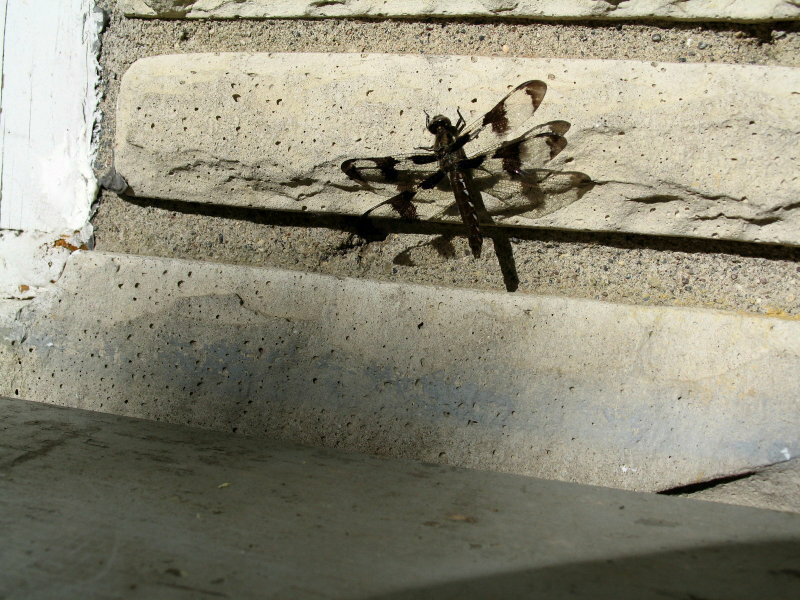 The photos of the dragonfly on the brick are stunning. Was everything black and white in reality, or did you shoot with b/w film? I bet that was just the quality of the light and the colors. Very lovely. Glad to hear you’re finding peace on this day. You have a big trip ahead – good to be rested as you embark on the journey. ybonesy: you are right – the quality of light when I shot these photos makes them look black & white. There are only a few spots where you can see low steaks of blue. I love that about the way photos capture light. Many times when I see the actual photograph (as opposed to the live image), I am surprised, too. I’m packing and doing laundry. I spoke to my mom this morning. I do have a big trip ahead. I’m not totally prepared. But leaving with an open mind and heart. Just back from the pilgramage, QM, and am so happily exhausted. Sitting in the car in front of the cafe – just not feeling like going in, plus tomorrow I’ll be back online. Want to let you know that my Dad and I talked the entire day, from 7 until 7, on the highway, in the car, at the McDonalds, at the cemetery, in the little towns, in Eske’s Pub, at Mabel’s, the whole drive home through the high road to Taos. Talked about every thing under the sun. Bliss. Enjoy your trip with your mom. Much love to you both. Just reading that makes me happy, ybonesy. It sounds like heaven to be able to have those kinds of conversations with your Dad. 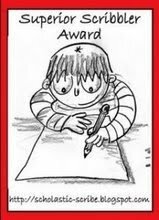 Can’t wait to read how it all comes to land in your writing. I’m looking forward to spending time with my Mom. Time is a great gift. Another update on the garden, just in case we forget who’s in charge. The 5th green inchworm came flying off the American Cranberry Highbush as I sprayed it furiously with the hose tonight (a tip I got from doing a google search on ‘pests on dogwood’). The gaping holes started appearing on the brand new dogwood we got a few weeks back. Then noticed it on the cranberry. According to the garden neighbors we needed to spray with nontoxic soap. Sure ’nuff, the green worms came out of hiding and I started plucking. Why are they beautiful and not the green inchworm? Because the dragonfly eats the mosquito (makes me happy) and the worm eats my new bushes (makes me sad). I can’t believe you found yet another green inchworm with those big munchy jaws! Gosh, between the deer chomping the tops off the bush clover and the inch worms eating the American Cranberry Highbush, I’m starting to wonder if there will be any garden left! Thank goodness for the good old garden hose, non-toxic soap, and Midwestern determination! Keep up the good work! Dragonfly eats the mosquito and draws the flame.